This is a poem, entitled “Lessons,” written by a good friend, Shannon Collins, who teaches teachers and teacher-wannabes here. Shannon was one of two friends who attended last week’s reading by Mary Oliver with me, and we talked a bit about education that night. He sent me this a bit later, one of his poems published in the Spring 2003 issue of Now and Then. The assignment was to draw the moon. for scooping and sprinkling at show-and-tell. from eyes to mind to heart to hands she drew. Thanks to Shannon for sharing. For those of you interested in more about Susan Gal’s book: I’ve had an ARC for a while now and assumed the book was already on shelves, but I see, upon further investigation, that it will be released in November. But when that time comes, you will be doing yourself a favor to take a gander at Night Lights — particularly, if you’re a fellow Illustration Junkie. Or, you know, afraid of the dark. 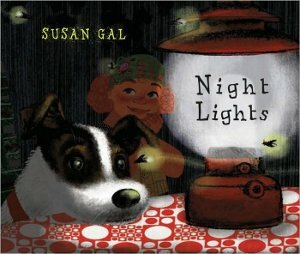 Susan’s picture book debut celebrates the lights of night, as a young girl—with her mother and pet dog—head home on their bikes after some shopping (“streetlight,” “headlight,” “porch light”); have dinner; throw a birthday party for the pet (“candlelight”); and hit the sack after a bit of play and the usual bed-time routine. This is a cozy, reassuring bed-time read and doesn’t try too hard to be anything but. Susan, a graduate of Art Center College of Design, uses mixed media and collage (or so it seems to me)—and her dark night-time palette, splashed with the vivid yellows of the night’s lights—to bring us highly-patterned and texturized illustrations. They’re busy — but not overwhelming. They’re detailed and inviting and ones to pore over if you’ve got a moment or two — and get as excited about illustration as Yours Truly. I’ll come back Friday and add the Poetry Friday host for the week. Until then . . .
Poem by S.D. Collins. Originally published in Now and Then 20 (3) Spring 2003: 6. Used with permission of creator. All rights reserved. NIGHT LIGHTS. Copyright © 2009 by Susan Gal. Published by Alfred A. Knopf/Random House, New York, NY. All rights reserved. This is not politically correct to say, but my Mom just “lost” a teacher at her school who was like this teacher. I love the idea of the earth and sky playing tic tac toe, I love the imaginary texture of scooped-up pixie dust for show and tell. Lovely, lovely. Coloring outside the lines is the BEST, and cheers to sparkly-souled teachers who don’t disparage what they don’t understand. I love books that label and explain things, and this Night Lights book has absolutely magical illustrations. Laura, yeah. Isn’t it great? Tanita, well, this isn’t PC to say, but I’m glad she wandered and got “lost”! My four-year-old colors in the lines EXACTLY, and the five-year-old is all scribble scribble coloring hastily, yet she comes up with the best original drawings. Some people have expressed concern over the fact that she’s not coloring in the lines, so then I always start annoyingly singing the Harry-Chapin song. As I just wrote on Facebook, Susan’s Gal art work to me is kinda like Ezra Jack Keats meets Margaret Bloy Graham in a bar and they share a drink together. Lovely imagery. Not only are you turning me into an illustration junkie, but an educated one! I can’t wait to find this in November. Thanks, Jules. What a beautiful poem, with such a loving message about the importance of letting children (and adults, for that matter) express their creativity in whatever way it chooses to be expressed. I had teachers like the one in the poem, but the ones I especially remember were the teachers who filled me with “kindergarten wonder” and encouraged me to aim for the “airy regions”. And I do see the “Harry” similarities in Gal’s dog illustrations, Jules – that was one of my favorite books as a kid. Great post, as usual! And Jules, you KNOW how I feel about the moon. So this whole post is perfect, in my eyes. Thanks, J, and Shannon and Susan too. WOW! I was blown away by this work. The imagery just captured me and drew me into the world of this kindergarten. I too loved the tic-tac-toe reference, airy regions, and stars that flexed was powerful to me. I do have to see I was deflated when I read the last line. Isn’t one of our goals as teachers is to bust out the ordinary and encourage children to go the extra mile? One question that I thought of after I read this work was will the child fully engage themselves the next time they are given another assignment? We love this poem. It is so vivid. As future teachers we want to be creative and never squash a child’s vivid imagination!! I think that it was a really good poem. I think that even though the assignment was suppose to draw the moon that the little girl looked beyond it. She saw the sky with all the artist that she had heard of and she crossed two artist and saw every color in the sky. She saw a blanket of sparkles for the sky. Her teacher didn’t approve of her interpretation of what she saw. “Lessons”… absolutely wonderful!! Sad but wonderful… I have so many times seen these teachers. we all have those teachers who dont like us to draw what we want. They want us to conform and draw what the want us to. They are holding is back from doing something greater. ahh… too bad another teacher that does not understand DAP and the child who thinks outside the box. IT brings back memory of our childhood. This poem was awesome . The pars that stood out to me was my favorite. ‘from eyes to mind to heart to hands she drew’ its so special the way children simply take every illustration to their soul. Her imagination of walking up the sky to see the moon tells you that she was taking distinct time to exactly draw the moon and to use everything she sees fit to make sure its perfect and then to have a teacher rip that apart is just exactly how it should not be modeled to children. This poem hits home to me and its a great illustration of what not to be to a kindergartener. I really liked this poem. It made me think of the time when I went to the lake and saw a shooting star for the first time. I think I fell in love with stars at that time. Its really upsetting that a teacher would be upset for a student to advance themselves. I have actually had a teacher like this. That really hurts for an actual teacher to be like that. I loved this poem. I loved the way of interacting with the sky and moon. The ending was upsetting because how could anyone (teacher) ever say that. The line about the blunted crayons was neat to imagine because you don’t have to be perfect by coloring inside the lines. I would love to see what the student drew. The words are used wisely and creatively. I love this! It is such a great message about letting kids run with their imagination and their creativity. I think it is important not to stifle that especially when it comes to children. Thank you so much for sharing it was great! Sadly, I have seen this in classrooms today. Some teachers have taken away their student’s imaginations 🙁 The child in the poem drew what she saw in the sky, the details were excellent. It is truly a shame that the teacher could not appreciate her art work and even more her creative imagination. What a shame. This poem takes me back to Kindergarten block and myself as a child in kindergarten. The first line caught my eye because whenever I hear or say the word “assignment”, I kind of cringe. To limit a child’s thoughts and creativity when drawing to an “assignment” is wrong, especially as their teacher. I really liked the imagery in this poem, and many things made me think of things in my life. I enjoy looking at van Gogh’s Starry Night, and I like listening to Josh Groban’s “Starry, Starry Night”. I truly enjoyed going on the journey of drawing with this girl! Thank you for sharing! The little girl in the poem was so excited about her assignment, and had set no limitations for herself. Creativity was flying through the little girls mind, and that is such an awesome thing for students to have. BUT when the teacher told the little girl she had done the wrong assignment the desire to be creative was taken away. Many times teachers want students to follow stay within the box, but what are we taking away from the students when we do this. A student should have an opportunity to be creative, and not worry about teachers telling they have done the wrong assignment. This poem made me as a future teacher wants me to encourage my students, and rise them up. And never bring them down!!! We are sitting in class, doing an exercise about interacting with the text. The text at hand, just so happened to be your poem. Our very own professor at TTU. How wonderfully talented. At first I asked myself, what is cirrus? Then my thoughts were swallowed by memories of the classroom in Kindergarten-Second grade. My mind wondered past years of education and found itself in the art classroom at Spring City Elementary… studying van Gogh and his masterpiece “Starry Night.” As an eight year old my eyes fixated on the charcoals and pastels, mesmerized by the journey that lay ahead. I was to re-create the starry sky after a famous artist??? However, we were nurtured and imaginations flared as the weeks went on. I walked out that art room one day with a re-creation that was my interpretation and mine alone. This was splendid. Thank you for sharing! The power of imagination…how sad it is to see that so many teachers don’t encourage this or bring some children down. We should always allow the students to take their imagination from eyes to mind to heart to hands. We should always allow the student to interpret and have their own view and never tear them down. We have so much power as a teacher…be careful how you use this power. I think this poem is a great way to reflect on how so easily a teacher can crush a student. As a future teacher, I realize how I don’t ever want to make one of my students feel as if just because they have a different idea or a different image than I might see, it doesn’t mean that that has to be a bad thing. I love this. It is so sweet. I think you paint the perfect picture of a kindergarten student full of excitement for learning. I think you said it perfectly when you said ” she climbed as high as the rusting swing could offer”. This made me so excited to see the imagination and creativity coming from this little girl. And gosh, the ending broke my heart. Unfortunately, this happens. How sad it is that a teacher would frown upon imagination. I don’t even want to know what comments like that would do to a innocent child. As future teachers, it really makes us think about the kind of teacher that we are striving to be. The poem is perfection! Yes yes yes to its message. Night Lights looks magical. How much do I love that dog’s snout resting on the table? That looks like a lovely picture book. I love Shannon’s poem. How true it is that harsh words from a teacher can crush a child’s feelings of wonder. Fortunately, when I taught, I worked with exceptional teachers who inspired each other. It was such an enriching experience for me –and certainly for the children who attended our elementary school. My daughter was fortunate, too–she was a student at the school where I taught. Thanks for exposing me to her art! It is fabulous.